What if the animal the biome says to add is already in the supply? 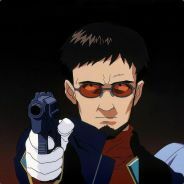 Is the on-buy other players trash supposed to be a positive or negative? Also, could you post all the cards in their most recent form somewhere in one post? It's hard to see them all at once. There all on the first page all in the first 4 posts. Well that’s why you would pick one random biome first. 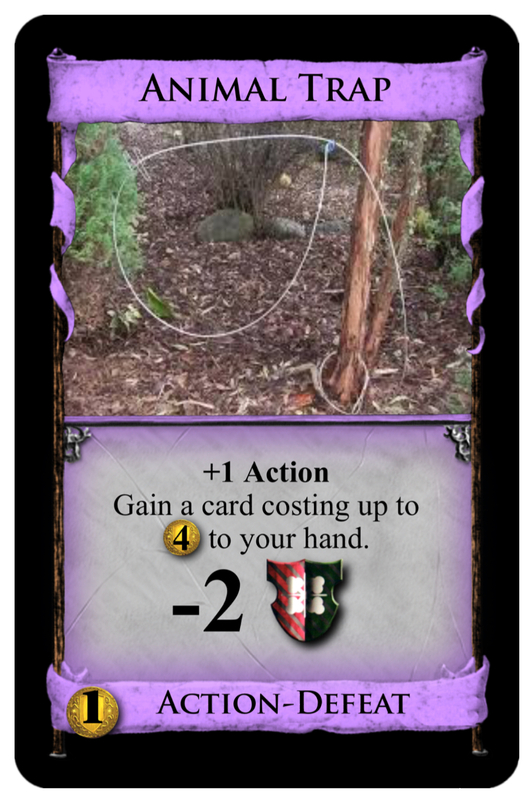 And then remove the card that goes with that biome from the randomizer. As for cobra, it can be both. Sure most likely they’ll have card they won’t mind trashing. But if bought towards the end of the game could be dangerous. I might have skipped the first page by only reading the new replies, and only checking back to look at the earlier cards. Yeah with wildlands I’ve been posting in the first page since the beginning, I didn’t that with snowline in the beginning though. Have you looked at my snowline cards on the first page? I’ve got quite a few unique ones in there too. Including a bunch of animals. Before I make any changes is there anything else about rhinos, do you like it? Does it need some improvements? Or how about some of the other cards? I didn’t seem to get replies about animal trap, fishing cat, or proboscis monkey either. 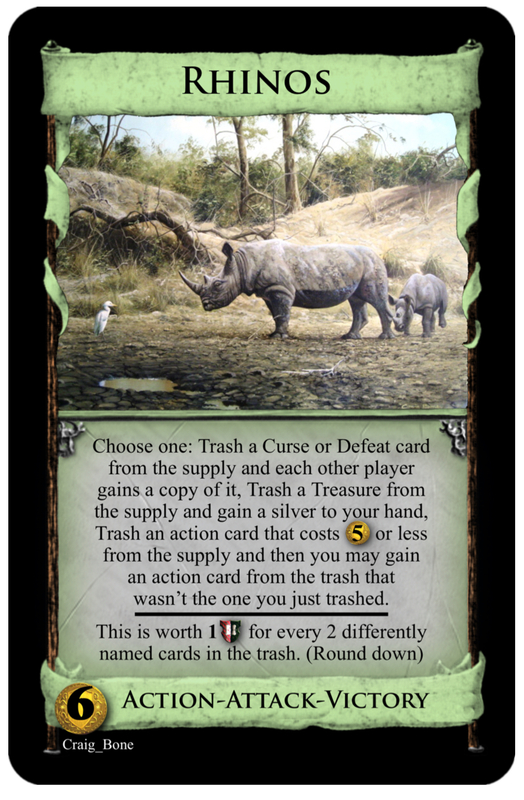 I was thinking of doing it that way, however I wanted to prevent players from using rhinos to trash Victory cards, and most actions. All my defeat cards are actions too. And once the curses were gone and any possible defeat cards were gone they could still use it as a half mine function. 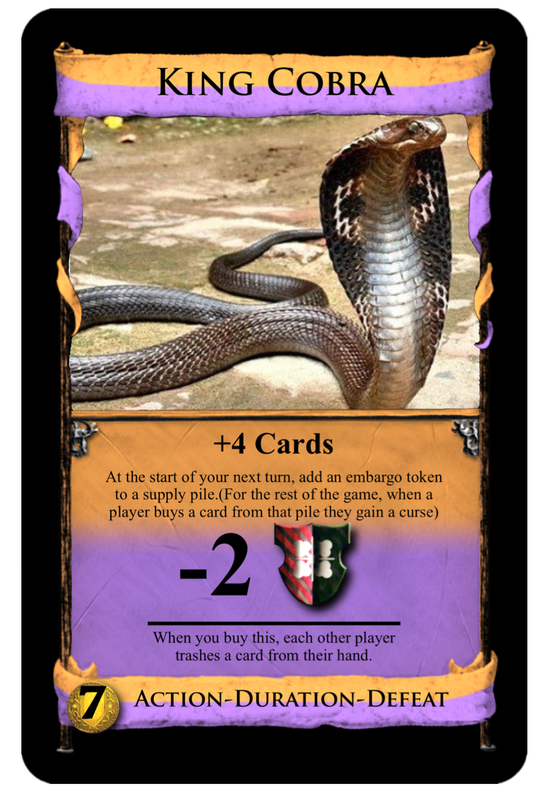 In a game we’re there are no ways to trash cards besides this, this card will limit the amount of curses each player will end up with. And at least replace all coppers or any treasure really with silvers. I didn’t put an additional benefit because it is a Victory after all. Of course I might make worth 1 Victory for every 5 cards in the trash. What do you guys think the amount of trashed cards should be, cause with cards like chapel this could give out a lot of Victory points. So I’m looking for a good vp balance. Choose from what? And why not just gaining a Silver or an Action? We only have 40 Silvers (and 60 Coppers) ! I don't quite understand your question. The formatting could be improved, but it seems clear to me that you have 3 options when you play this. All 3 options trash a specific type of card and do something else also. I think it's WAY too powerful. Even without the other 2 options, and the victory points it gives, this would almost read "gain an action". That's super strong by itself... almost all other "gain" cards are limited to gaining a card costing up to , and they cost more than (Artisan, University). This can gain Grand Markets and Goons in most games, and can gain King's Courts if there is a action available. And that's just one of three options. It's also a Cursing attack, though admittedly more limited because it has to trash a Curse to give a Curse. On top of that, it can easily be worth 5 (think about how many games have both players trash all of their starting 7 cards). In a 4 player game, there could easily by 28 cards in the trash; making this worth 9 ! I agree that Rhino is too strong. Strength aside, I also don't like that this card does so many things. 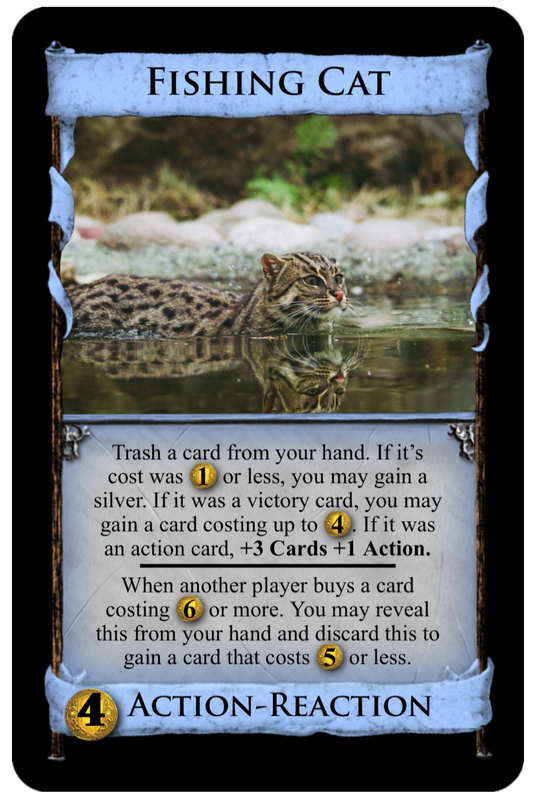 I like the general idea to trash a card from the supply in order to do something related, or to get points depending on the cards that were trashed. I also see why you want the card to do both: As points are the same for everyone, you don't just want people to piggyback on the work of others. However, this is also incredibly flexible. That's too much going on on one card. Worth 1 VP per 2 differently named cards in the trash (round down). This turn, the next time you gain a card, you may trash a copy of it from the supply. Worth 1 VP per 3 differently named cards in the trash (round down). How’s this version? I made it a little harder to gain an action card from the supply/trash. Especially if your opponent gains an the action you trashed on your last turn, you certainly won’t be trashing the higher costing Actions very often. And since actions won’t nessesarily stay in the trash forever it should keep the victory points at the minimum. I haven’t gotten any replies about my 2 night cards. I wanted to make tribal dance interactive without attacking. And thought black panther would be cool worth vps for attack cards. Sure, I'll bite. Both cards seem decent as-is. 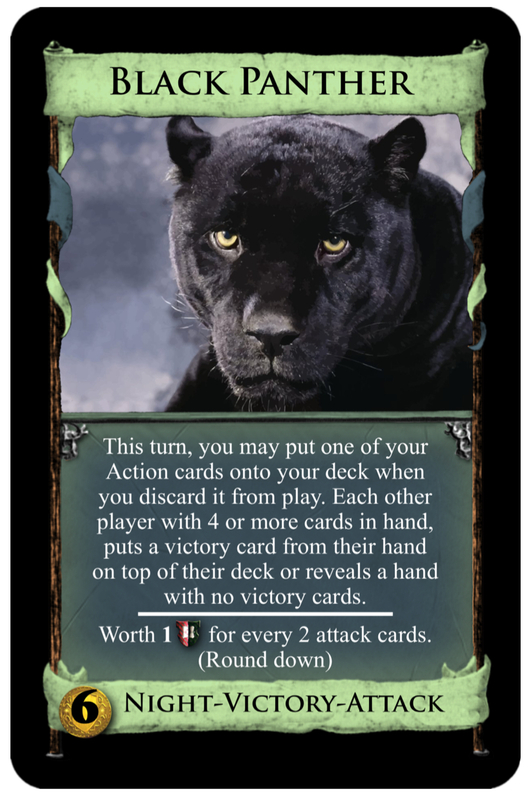 Black Panther could actually not wait till discard from play to put Actions on your deck, because it's the Night phase; what shenanigans may ensue from you doing it immediately? I'm not sure yet. Black Panther's score rule could use some clarifications; I'm assuming it's 1vp per two attack cards in your deck? Tribal Dance is good as designed, I think, assuming that you would balance the cost after playtesting; $2 may be too expensive, since the drawback is huge. 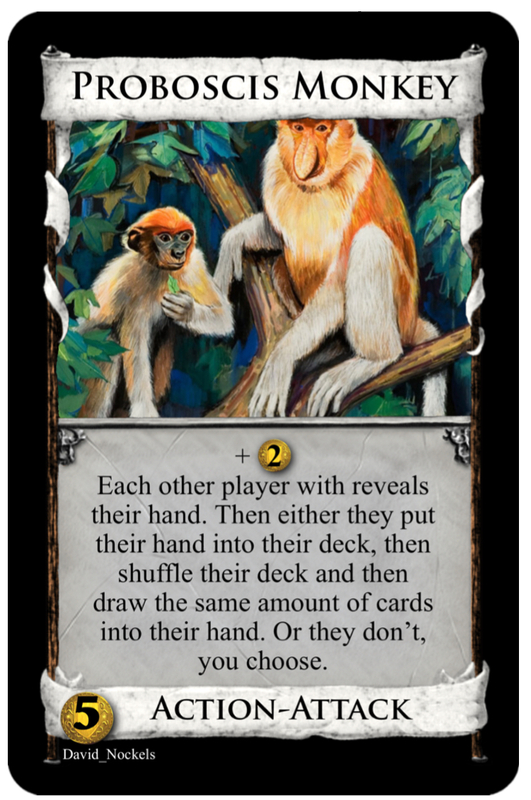 If it were up to me, I'd consider giving Tribal Dance a Duration: at the start of next turn, +1 Card in addition to its other effects. Hmm good idea make tribal dance a duration. Yeah I’ll make the black panther clarify in your deck. As for the shenanigans I made black panther similar to scheme. With a somewhat weak attack. Weaker than ghost ship anyway. Cause you would have to play 2 and if you had no victory cards in your hand you would be fine anyway. Which works with a vp point card. The Victory part of Rhinos is better now, but I still think the upper part is too flexible and has too much text. 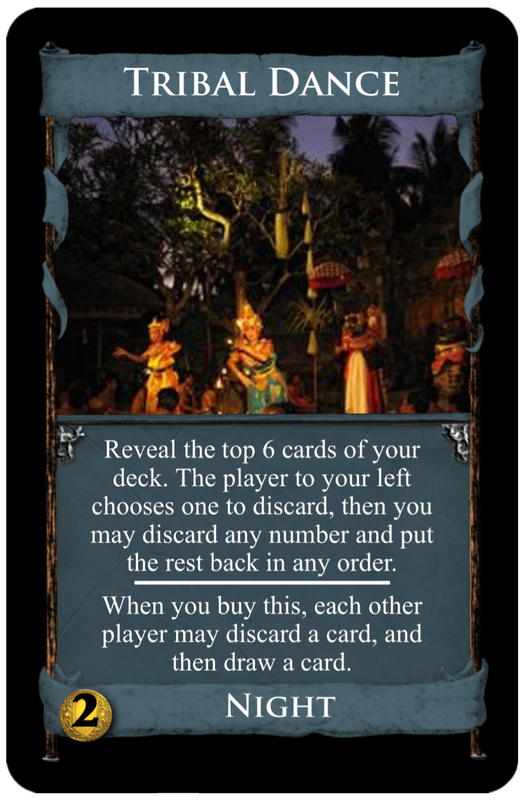 Maybe you could do an Ironworks-like wording, where you trash a card from the supply and only then look at the type, doing a different thing for Curse, Treasure and Action. I like that idea for rhinos I’ll try it out.